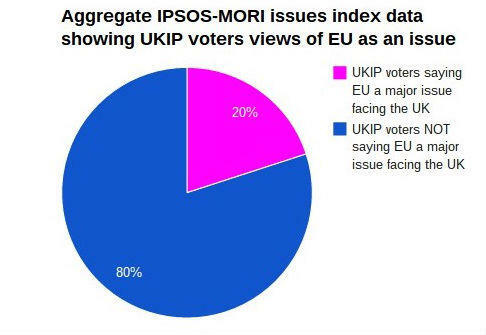 Bloggers4UKIP: Only 1 in 5 UKIP voters consider EU a "key issue"
Only 1 in 5 UKIP voters consider EU a "key issue"
Once again dispelling the myth that UKIP is a single issue party, a polling company finds that only 1 in 5 UKIP voters consider the EU to be a "key issue" facing the country. So what attracts the other 4 out of 5 UKIP voters to the party? Why not take a look at the most comprehensive manifesto of any UK political party and find out for yourself?